The inside of your home may be immaculate. 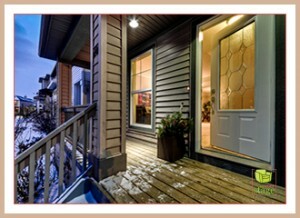 But if you’re selling, and the outside looks a little rough around the edges, potential buyers will be turned off. Staging outside matters as much as it does inside. So pay attention to your listing’s curb appeal and do the dirty work before the For Sale sign goes up. 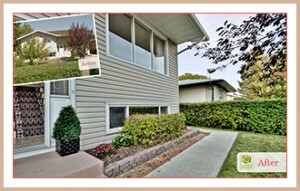 Before: Curb appeal no longer refers to only the physical condition of a property. 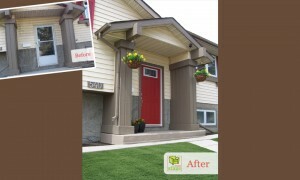 Virtual curb appeal (online photos) will draw buyers to your step. 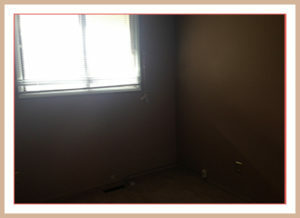 After: This home sold in 12 days. Have you ever walked or driven by a house in a nice neighbourhood only to see that it’s looking unkept? Fence is falling apart. Grass is like a jungle. Paint is chipping off. There’s a dent in the garage door. Empty garbage cans are lying around. There are few signs of life. Imagine if there was a For Sale sign on the front lawn. Would you be excited to see inside? Well you might be if you are an investor looking for a bargain. But if you are looking for a home to raise your family in, you would most likely keep looking elsewhere. Poor curb appeal tells a powerful story. This front entrance is now welcoming. The point is that most of us make a pretty quick judgement about whether we feel like a listing is suitable based on first impressions. After all, if it looks that bad on the outside, imagine what problems are lurking behind the walls inside. No thanks. I’ll pass. When you decide to sell your home, it’s to your advantage to invest some time, money, and good old elbow grease in making the outside look as inviting as possible. I’ve shared some tips in the past for staging outdoor spaces to maximize curb appeal. And this infographic is also helpful. Bottom line? Don’t overlook the power of curb appeal to attract your ideal buyer. Do the work to beautify your home’s “cover” and let potential buyers judge the suitability of your listing based on a positive first impression. For many property buyers, the home is the hub for entertaining. So why not intentionally stage for buyers with that in mind? 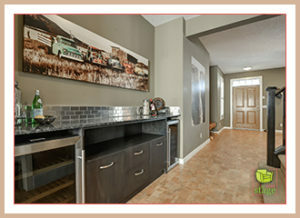 Create a bar area or other entertaining-friendly space. 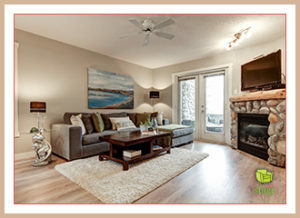 Help your potential buyers see themselves living and entertaining in your listing and benefit with a faster sale. 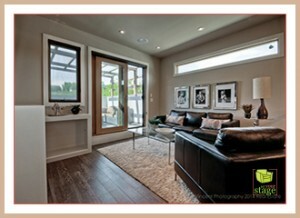 A property we staged in Garrison Woods Calgary made it easy to stage for buyers who love to entertain. It already had a built in bar area located between the living room and dining room. By staging it, we gave it life, adding some atmosphere and highlighting it as a key feature of the property. After: Entertainer’s dream bar area between the living room and dining room. But you don’t have to have an existing feature like this to successfully set the stage for entertaining. A quick search on Pinterest will result in great ideas. I love bar carts that can be styled for a range of functions~ after dinner drinks, coffee, or brunch ~ depending on what type of entertaining will be happening. Carts offer the ultimate flexibility, portability, and ability to stage effectively within a small space. 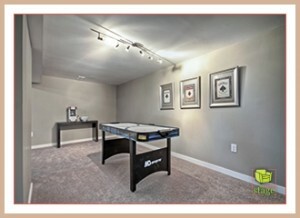 After: This is the perfect retreat/man-cave for the entertainer in your family. Have an extra room that doesn’t have a specific purpose? Stage it as a games room. Add functional and organized groupings of items that make sense together in the staged entertaining space to create instant impact. And don’t forget the outdoor spaces. When you stage for buyers who love to entertain, additional outdoor seating areas are a bonus. If you happen to have a pool, outdoor fireplace, or a great view, make a point of highlighting that too! 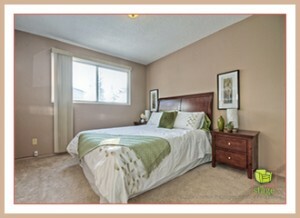 For more inspiration and home staging tips, check out Set Your Stage on Pinterest. 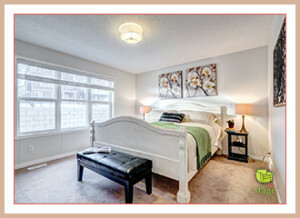 I work with a lot of clients who want to stage their house or condo for sale on a budget. They also happen to be open to do-it-yourself projects and prefer to use eco-friendly options whenever possible. My suggestion? Refinish wooden furniture quickly and easily with this simple homemade mixture. Once again, I was reminded how the solutions to many problems can be found on Pinterest! I had been looking for a quick and easy fix to give some older wooden furniture a facelift. I was decorating my own condo with some antique family furniture and had some pieces that were looking a little tired. Also, in my effort to make more environmentally conscious choices in my Calgary home staging business, I sometimes find great used furniture pieces with great bones that can serve a new purpose in my staging projects. In both cases, I want the solution to be clean, fast, effective, and green. Not only have I used this mixture to refinish wooden furniture myself, but I have recently recommended it as a tip for some of my Home Staging Consultation clients. It’s not perfect, but it serves its purpose. And because it’s so inexpensive and you probably already have the supplies in your kitchen, it’s definitely worth a try, don’t you think? Instead of buying new, first try to refinish wooden furniture for cost-effective staging when it’s time to list your home for sale. You are currently browsing the Set Your Stage weblog archives for June, 2016.